We thoroughly enjoyed our time on the island of Hawai’i, which was spent resting up after our long passage from Fanning Island, reconnecting with United States culture and society, celebrating the holidays with an eclectic group of cruisers, doing a few boat repairs, and seeing some of the Big Island. 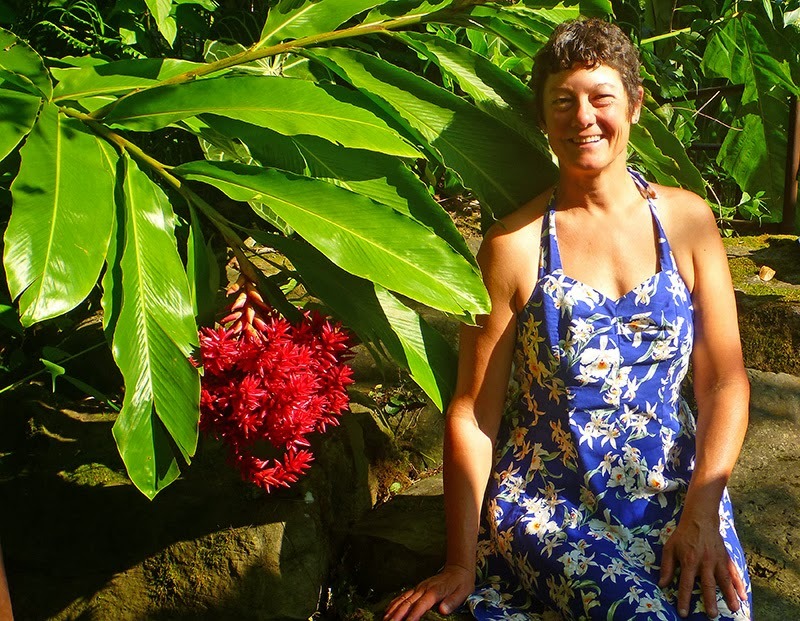 Hilo is a laid back town, and there were many sights to appreciate locally. We enjoyed its unique flora and fauna. Hawai’i has many colorful songbirds, both native and introduced. Around Hilo, we mostly saw the introduced species, but still couldn’t help admiring the bright red head of the yellow-billed cardinal. We saw several of the only species of native Hawaiian hawk, a chubby bird that looks more like an owl. 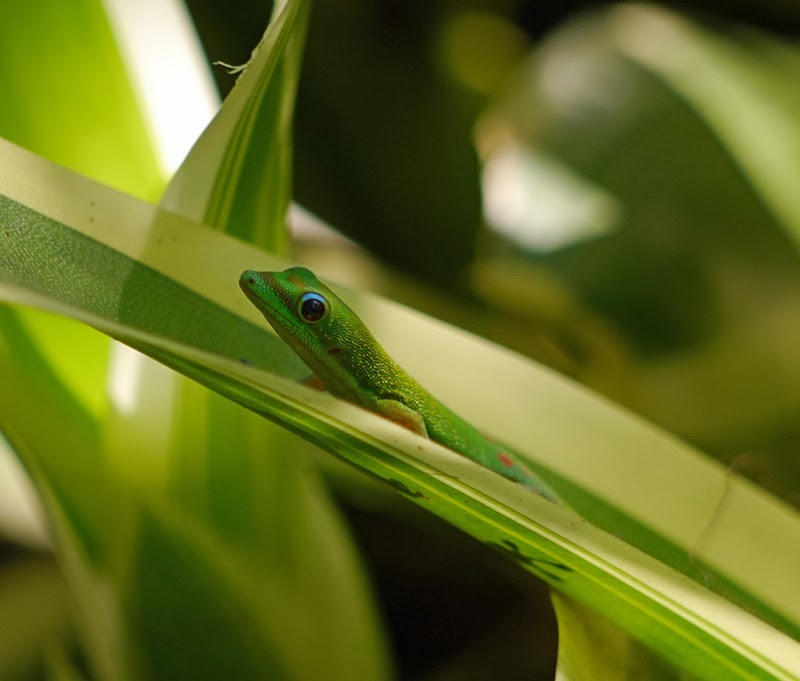 The introduced coqui frog, a type of tree frog, serenaded us with a deafening chorus in the evenings, as we walked down the hill to Radio Bay. And we saw many mongoose, whose story in Hawai’i has been well documented. 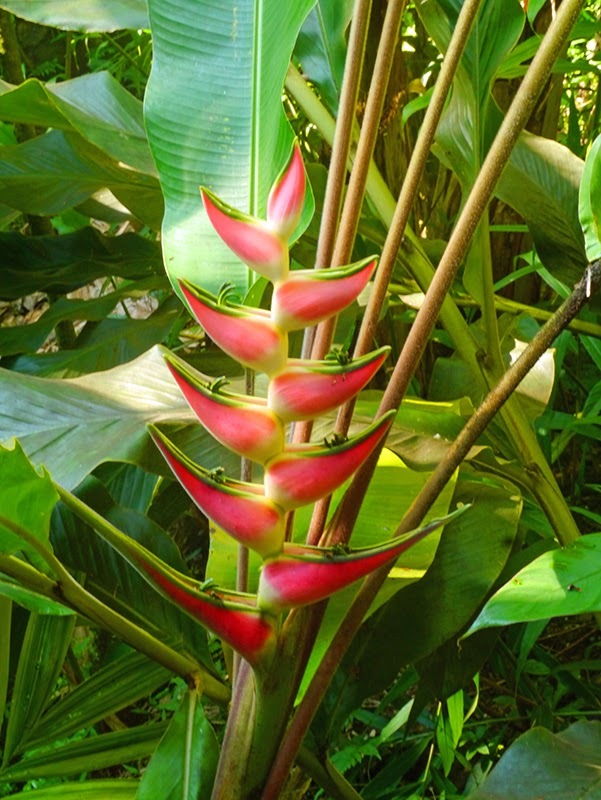 One of the trees sure to catch your eye in Hilo is the umbrella-shaped monkeypod tree. 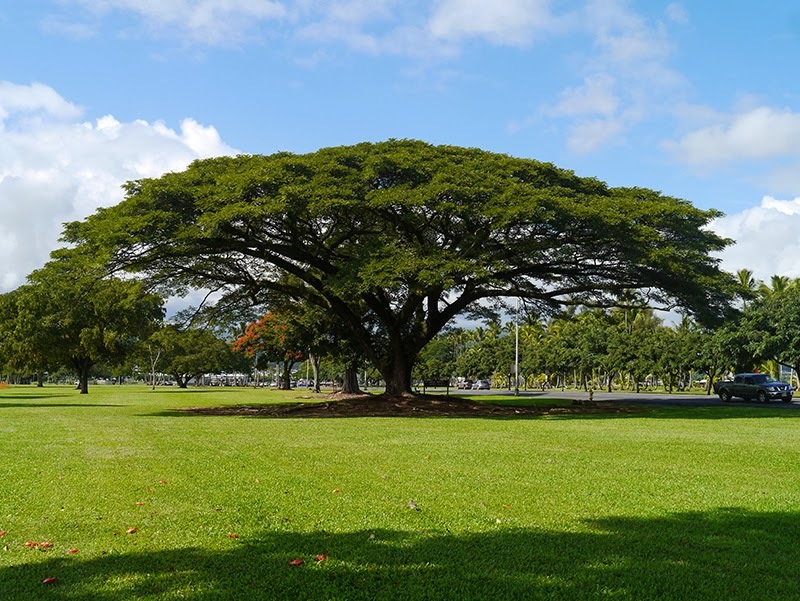 Also known as a “rain tree,” we have seen these trees elsewhere in our travels; but the specimens we saw on Hawai’i had much denser foliage than others we’ve seen. We learned that the “rain tree” moniker comes from the fact that the tree folds up its leaves in response to rain---a cool adaptation to a dry climate---so that the rain saturates the soil directly beneath the trees (and indirectly, its roots.) 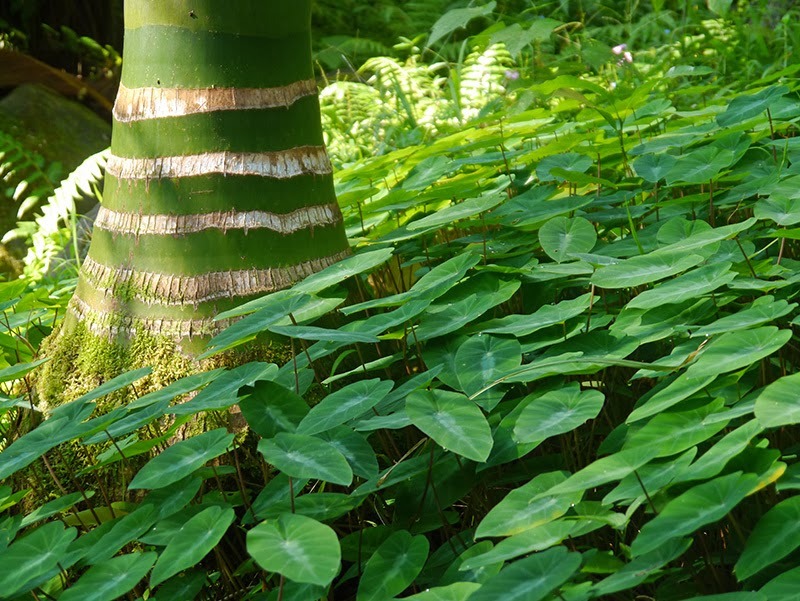 Supposedly, the grass really is always greener under a monkeypod tree! 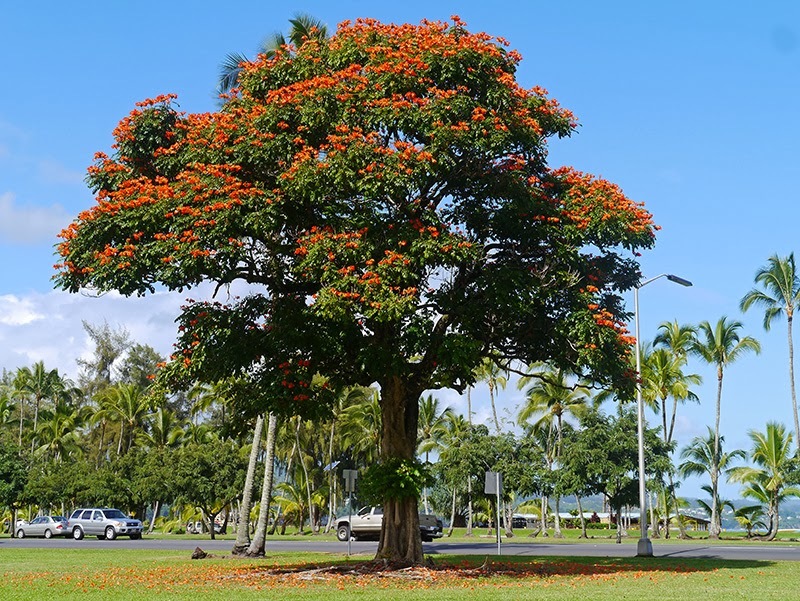 Another beautiful local tree is the African tulip tree, an introduced species that thrives in the Hawaiian climate. 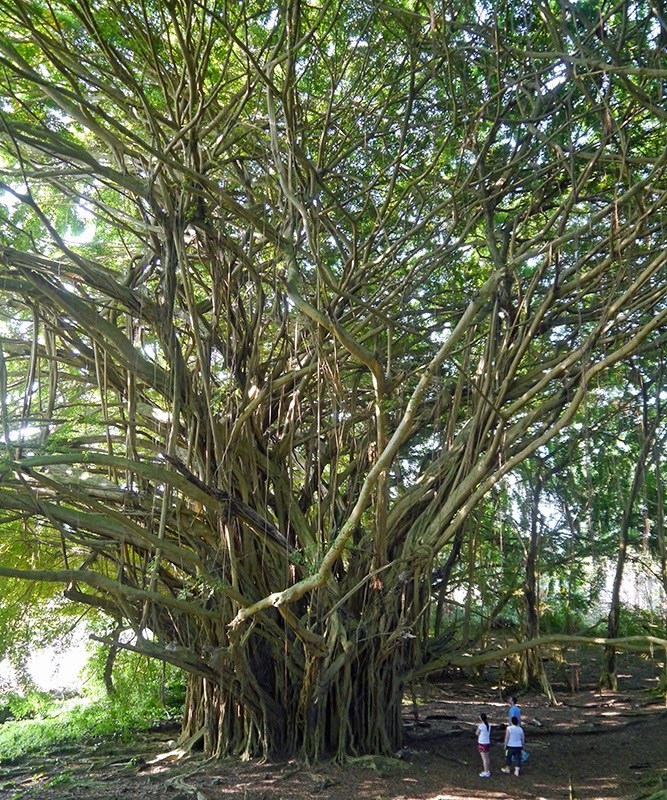 Hilo's homage to banyans, Banyan Drive, is lined with banyan trees planted by celebrities starting in around 1935. Richard Milhouse Nixon planted a banyan on Banyan Drive. 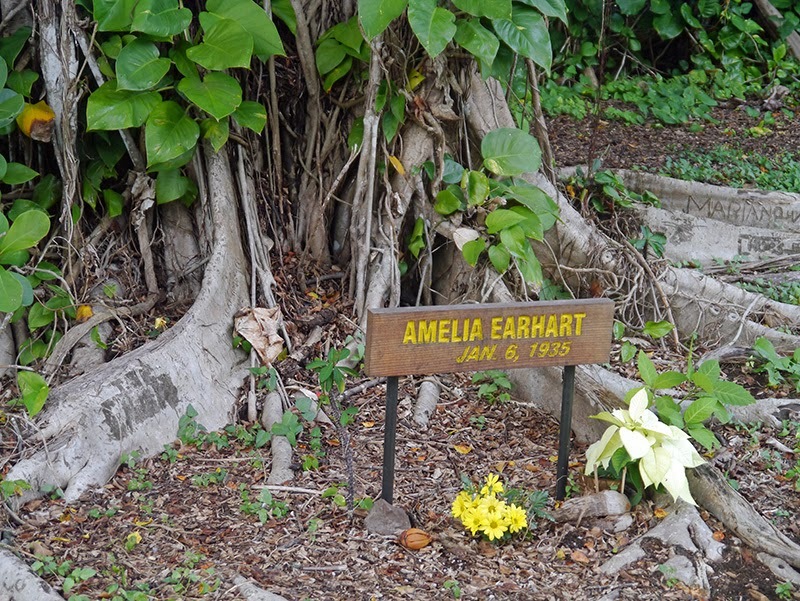 Some of the tree planters are memorialized with flowers to this day, such as these bouquets found beneath Amelia Earhart's banyan. Under other banyans, the plaques have been vandalized or removed. 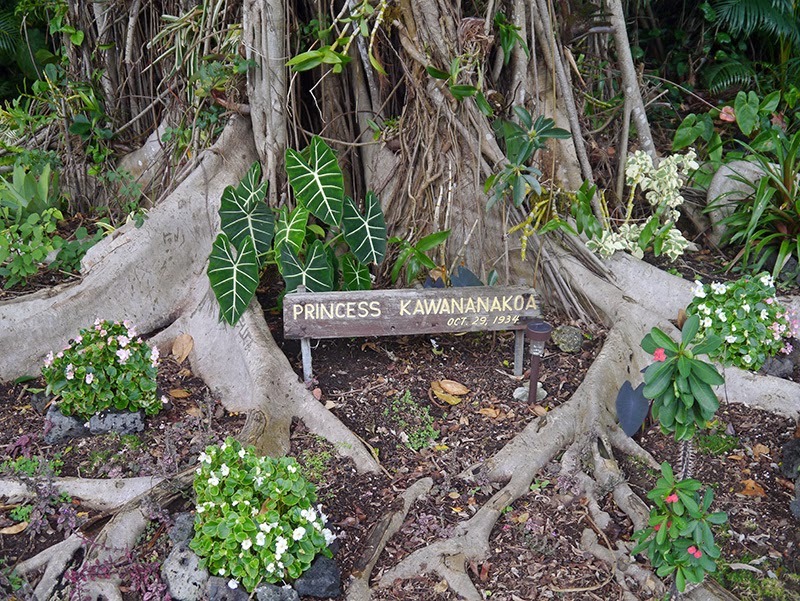 The loveliest garden was planted at the foot of Hawaiian princess Abigail Kawananakoa's banyan. 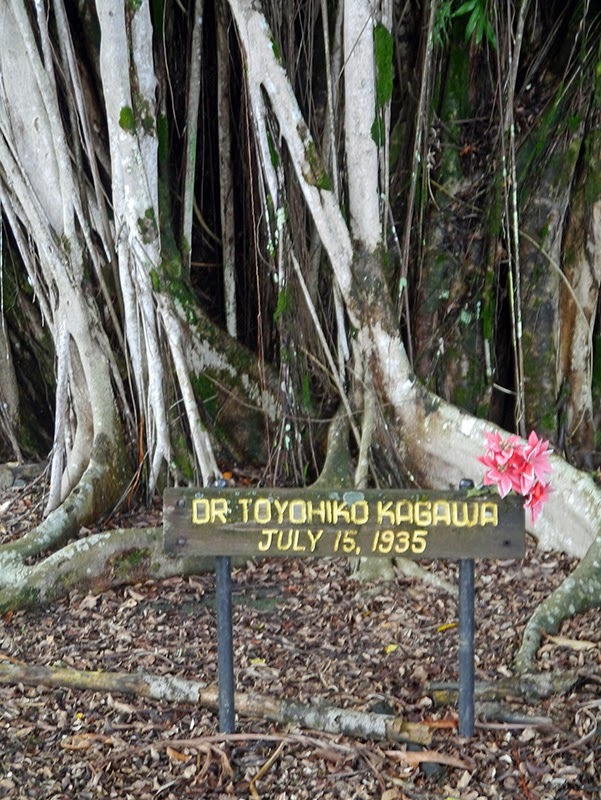 I was unfamiliar with some of the names represented on the plaques, which led me to do some research on Dr. Toyohiko Kagawa, a man who---like Mother Theresa---attended to the "sick, suffering, hungry, poor, and dying:" only Dr. Kagawa worked in the slums of Shinkawa, Japan instead of in the slums of Calcutta. 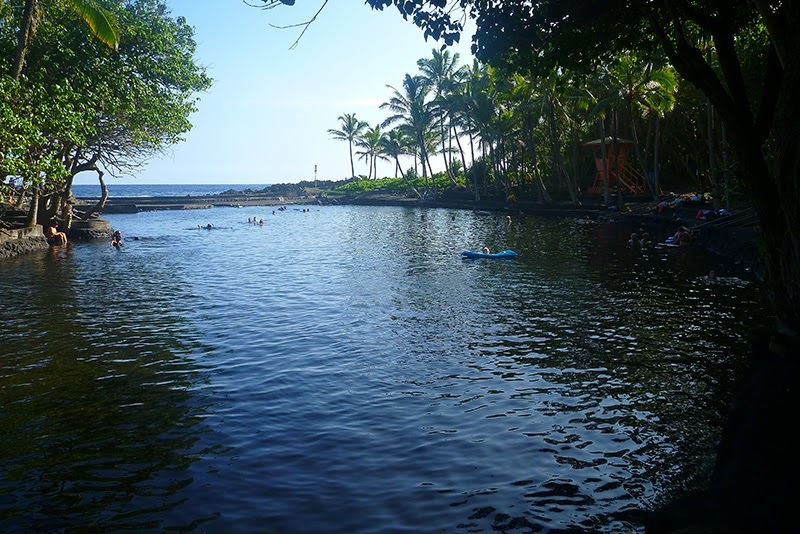 Hilo has many small local parks, what I like to call “pocket parks.” They are beautiful natural areas that are not very extensive, including many of the local beaches. 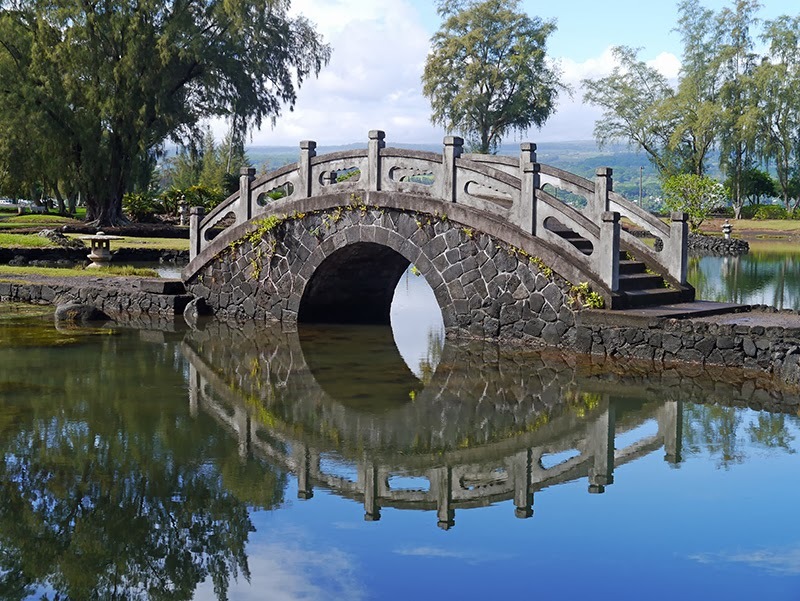 One of the larger parks is Liliuokalani Gardens, a Japanese garden, and a beautiful spot for a casual stroll. 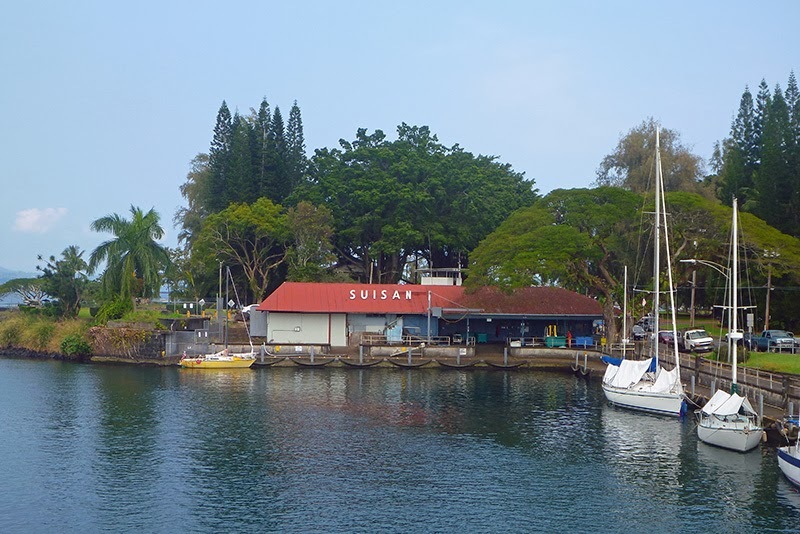 Near Liliuokalani Gardens is the Suisan Fish Market, where local fishing boats deliver fresh catch daily. Da best poke bowl evah, ya? 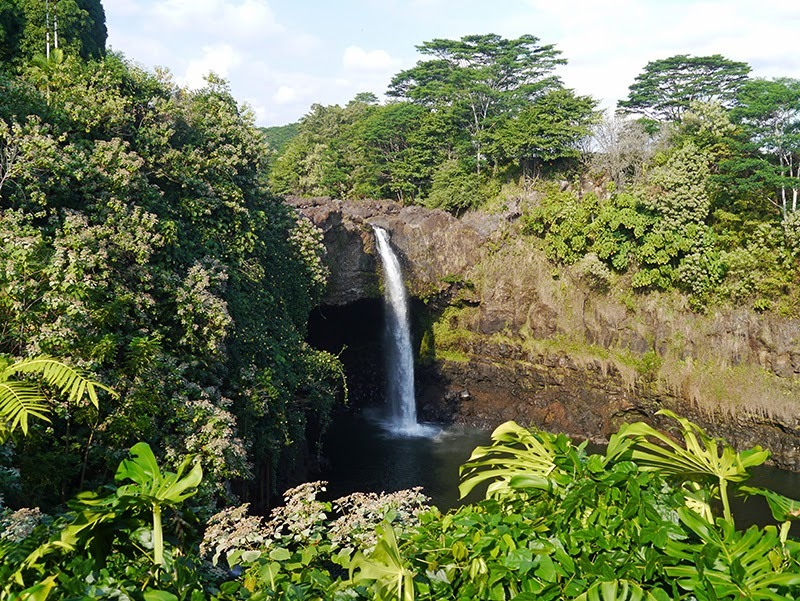 Just up the hill from downtown are Hilo’s Rainbow Falls. While we didn’t see any rainbows at the base of the falls (we probably didn’t arrive early enough in the morning), it was a scenic local stop. While in Hilo, we visited the Pacific Tsunami Museum. 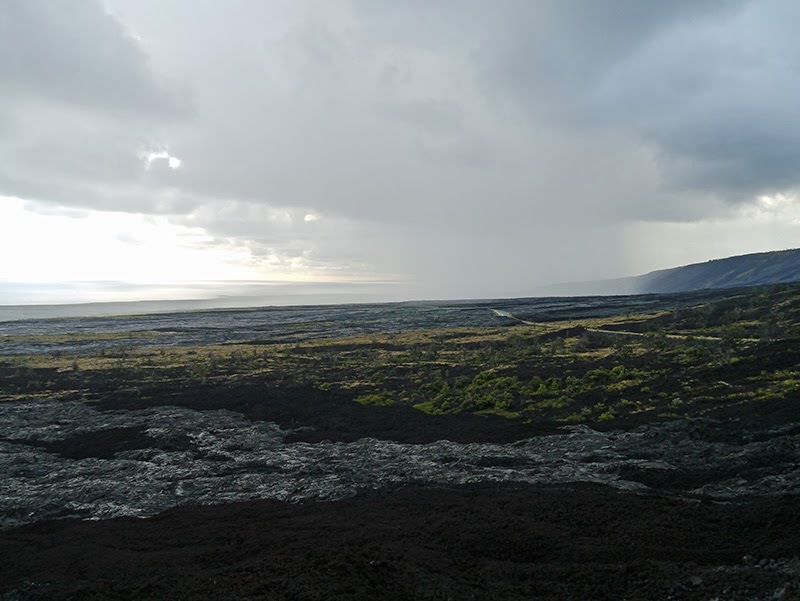 Part of Hilo’s history is the history of tsunamis in the Pacific. 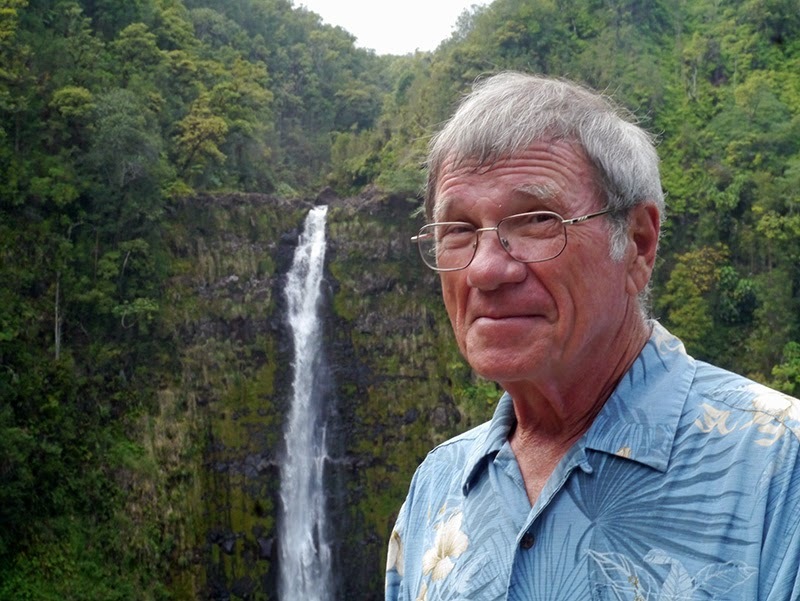 Hilo suffered a massive, devastating tsunami in 1946, before widespread knowledge about what tsunamis are, and before a tsunami warning system had been put into place. The 7.1 magnitude earthquake generating the tsunami originated near the Aleutian Islands. As the sea retreated from the intertidal area, people flocked to the exposed rocks to collect fish and shellfish. People who recognized the warning signs and tried to warn others about the impending wave were treated with disbelief because of the unfortunate date the tsunami occurred: April Fool's Day. There were 173 fatalities. On May 23, 1960, an 8.3 magnitude quake originating off the coast of Chile generated another seismic sea wave. During the 1960 tsunami, warning and evacuation plans were in place, and there were far fewer fatalities (61). Even with the warning plan in place, some people ignored the warnings, and some actually went towards the beach to see the wave. 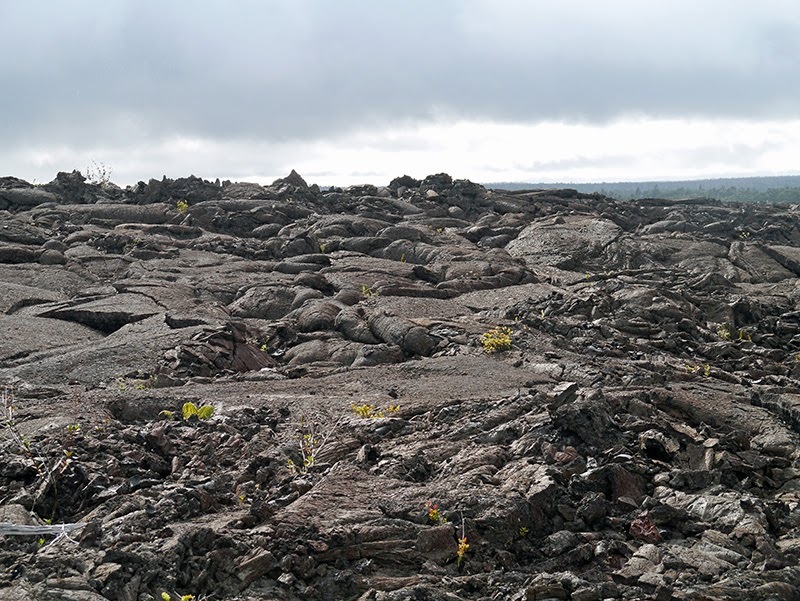 After the 1960 tsunami, the town of Hilo moved its waterfront back from the water. Entire former neighborhoods and the historical commercial center of Hilo are now park lands; while the current downtown area is set a safer distance from the waterfront. 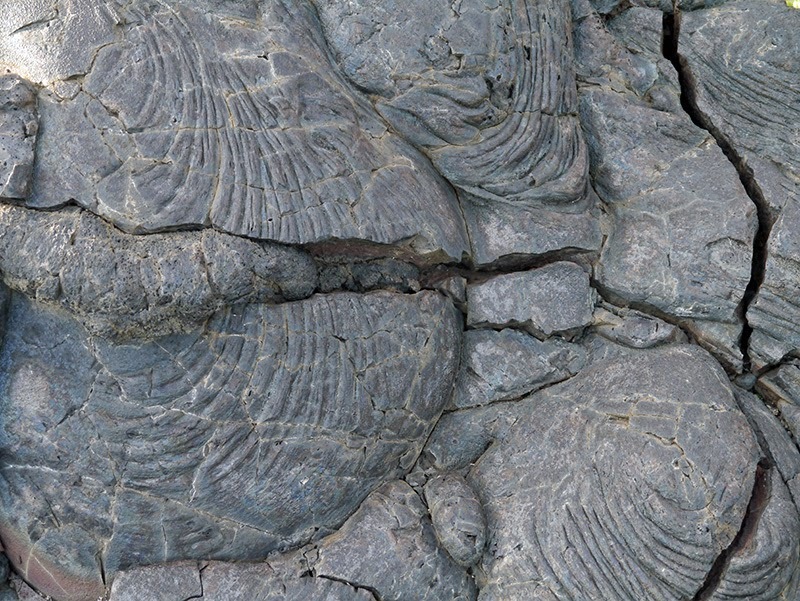 Further north, the town of Laupahoehoe, which was hardest hit by the 1946 tsunami, also moved its location from the shoreline to the ridge above the shoreline. One of the neighborhoods destroyed in the 1960 tsunami was Waiakea Town, a primarily Japanese community near Hilo's waterfront. 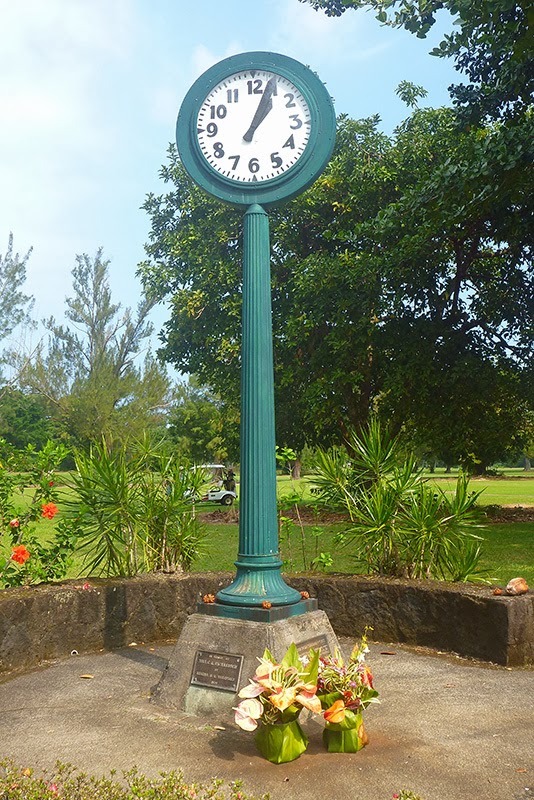 In another one of Hilo's informal memorials, people still leave flowers at the base of the Waiakea Town Clock----the hands of which are permanently frozen at 1:04 [a.m.], the time a 20 to 30-foot wave struck it--- in memory of the lives lost in the tsunami. A golf course now stands where Waiakea Town formerly stood. We also learned that a tsunami hit Hilo in 1957, between the 1946 and 1960 tsunami events, but since there were no fatalities in that tsunami, it is lesser known. The Pacific Tsunami Museum itself is located in an historic building that survived both the 1946 and 1960 tsunamis. The museum is text-heavy and not as interactive as it could be, but there are some videos of survivors’ stories and an interesting tsunami warning simulation. I found that the stories of the survivors were the most compelling parts of the museum. We also enjoyed the Lyman Museum and Mission House. 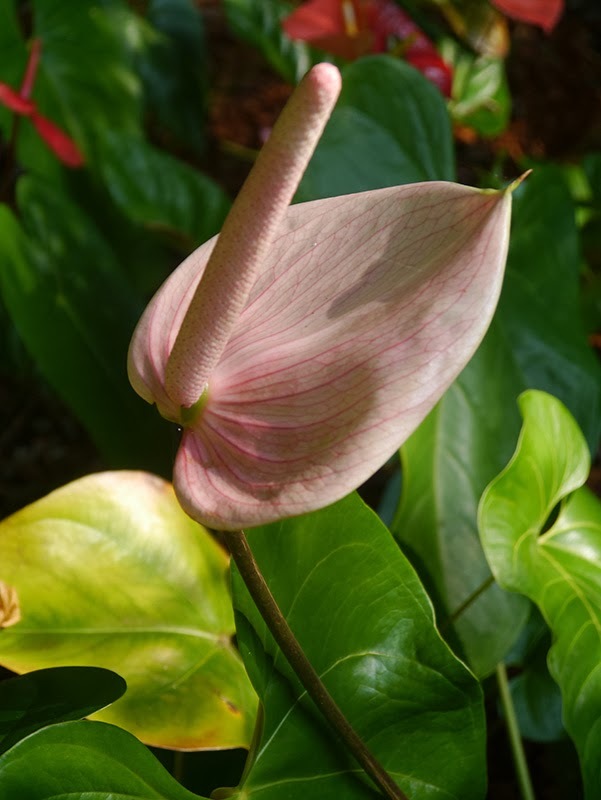 The museum had excellent collections of Hawai’ian cultural artifacts, shells, and minerals; and the tour of the Mission House was worth it for the interesting story behind the vocational program at the Hilo Boarding School for Boys. Several pieces of fine wood furniture produced by the Boy's School woodshop were on display in the Mission House. While in Hilo, we rented a car for a week in order to do some boat chores and so we could do some sightseeing farther afield. 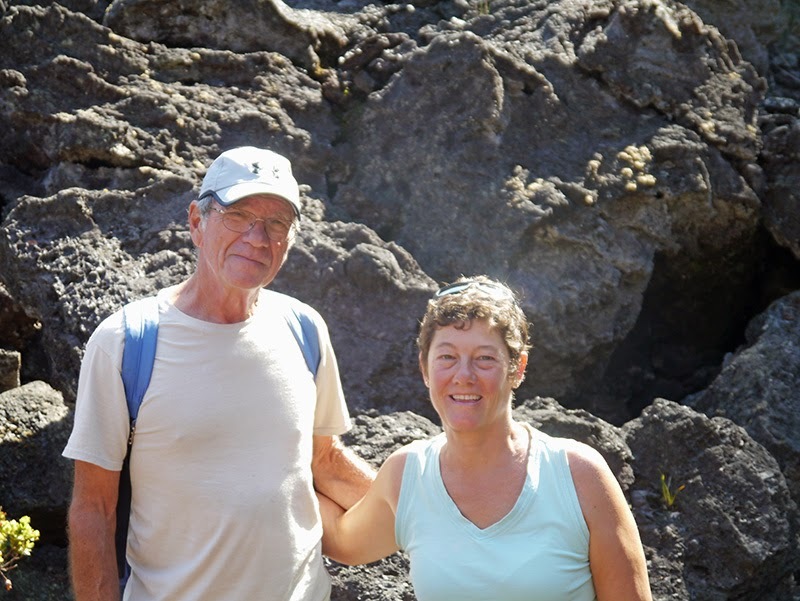 Our first trip was to the Kona coast, where we met up with our friends Mike and Marie, who were vacationing for a week. 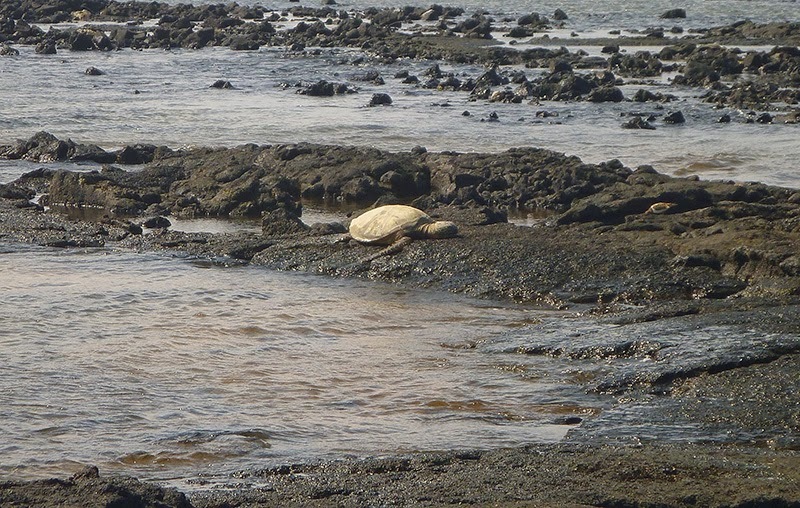 We had a meandering walk along one of the beaches near the harbor, where we saw some ancient Hawaiian fish ponds and a lot of basking sea turtles. Patrick and Mike on the dunes...We never got that group photo, Marie! On a second trip to Kona to do some reprovisioning at Costco, we drove around the south end of the island and visited South Point, the southernmost point in the United States. South Point is also one of the windiest spots in Hawaii, and a dozen or so large windmills were whizzing away just above the point. On the point itself, there were the remains of a heiau, or temple (our photo of it didn't turn out well), as well as these interesting "canoe holes." 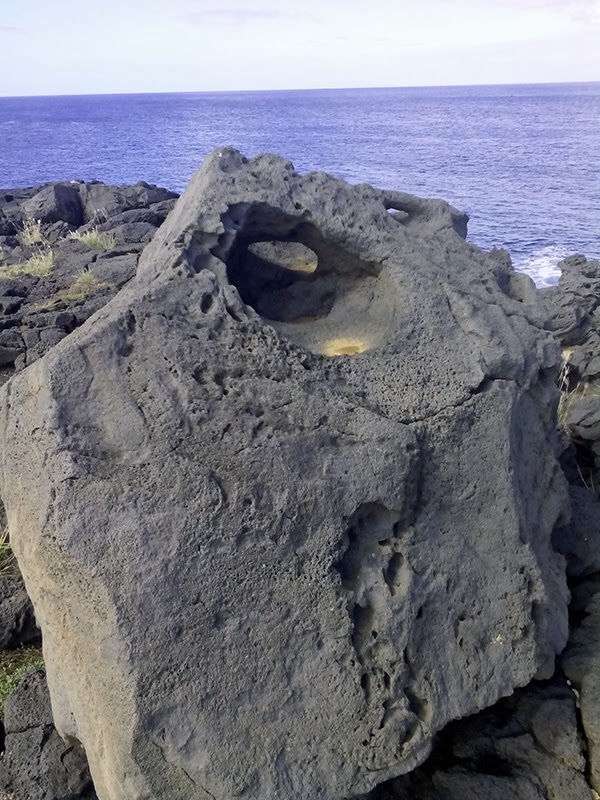 The wind and currents are so strong at South Point that ancient Hawaiians, fishing from their canoes, would anchor themselves to land by tying their boat off to a boulder on shore in order not to be swept out to sea. In both the Marquesas and in Hawai'i, we saw smaller versions of these rocks that were used as underwater canoe anchors. The water at South Point is too deep to use a canoe anchor; thus began the practice of using canoe holes on shore. 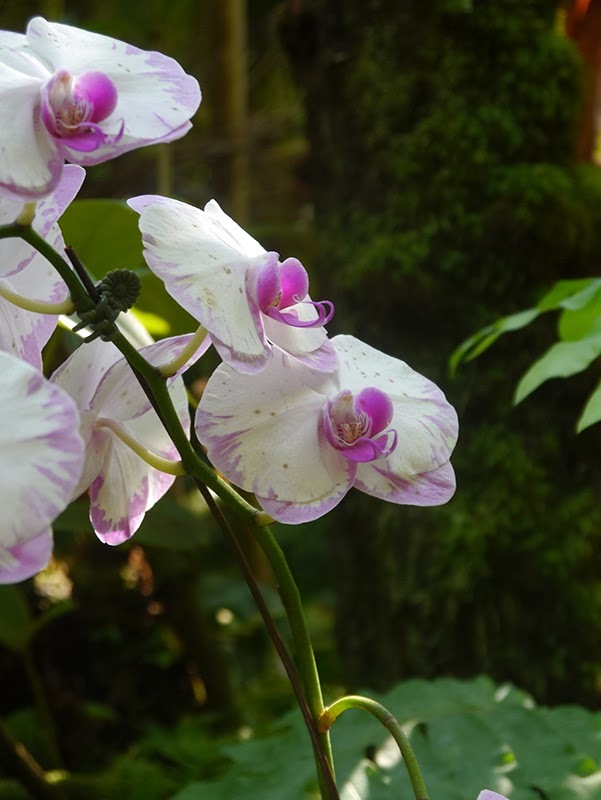 One of our favorite places on the Big Island was the Hawai’i Tropical Botanical Garden. 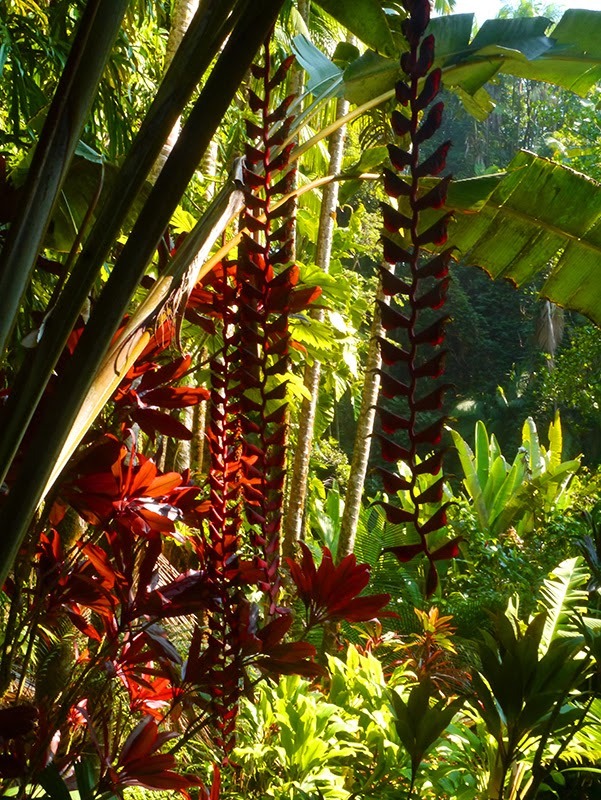 While many in the collection of flowering orchids, heliconia, anthurium, and other brilliant species are exotic (non-native to Hawai’i), the garden is a spectacle. 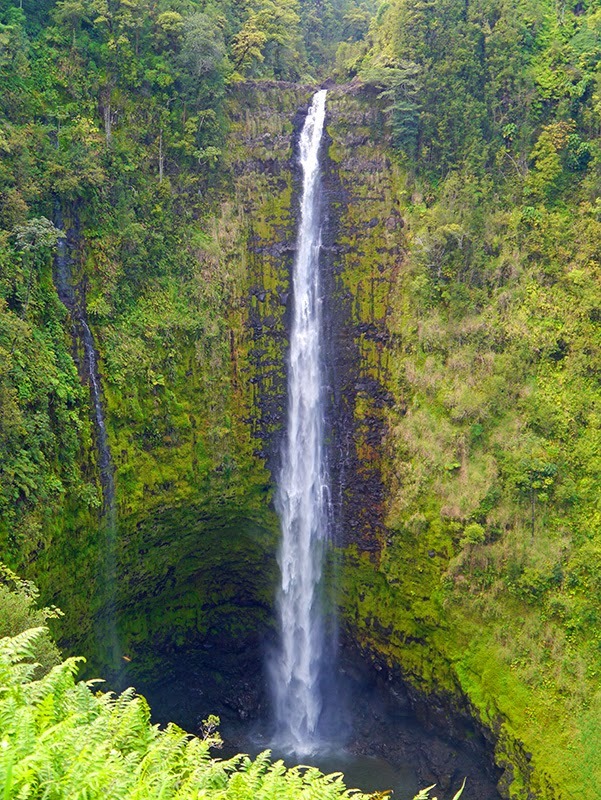 After our visit to the botanical garden, we continued our exploration of the Hamakua coast with a visit to Akaka Falls. 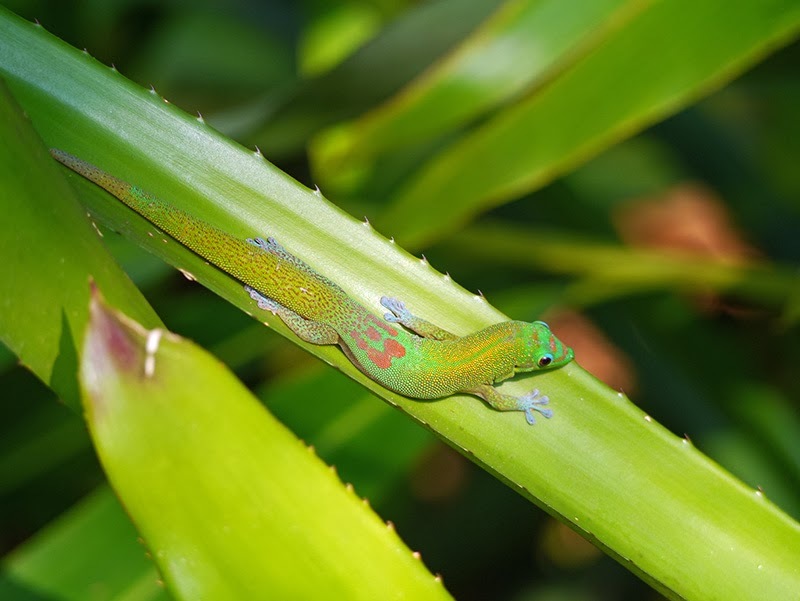 There, we learned that an endemic fish, a goby called 'o'opu alamo'o in Hawaiian, is capable of migrating up the 420 foot Akaka falls! The gobies prefer the upper reaches of fresh water streams. We went as far north as the majestic Waipi'o Valley, but we arrived late in the day and did not make the hike down into the valley. 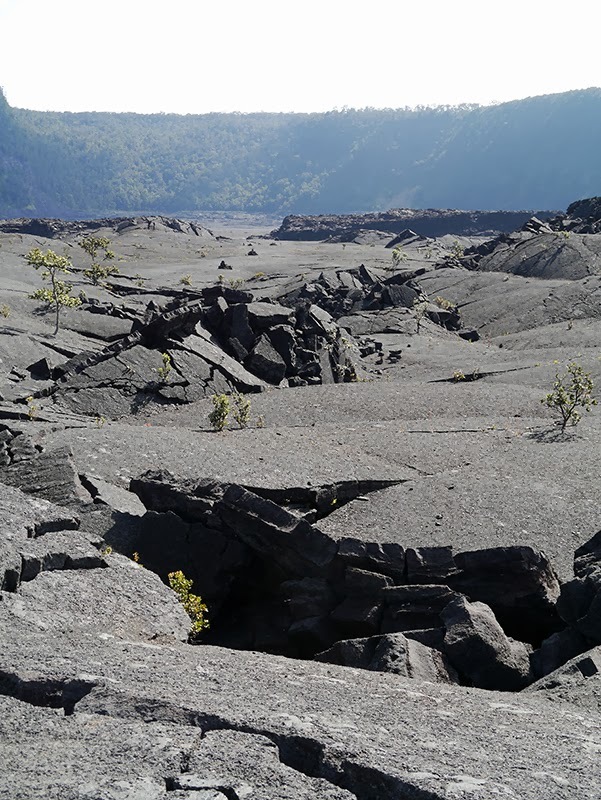 Another favorite spot on the island of Hawai'i was Kilauea in Volcanoes National Park. 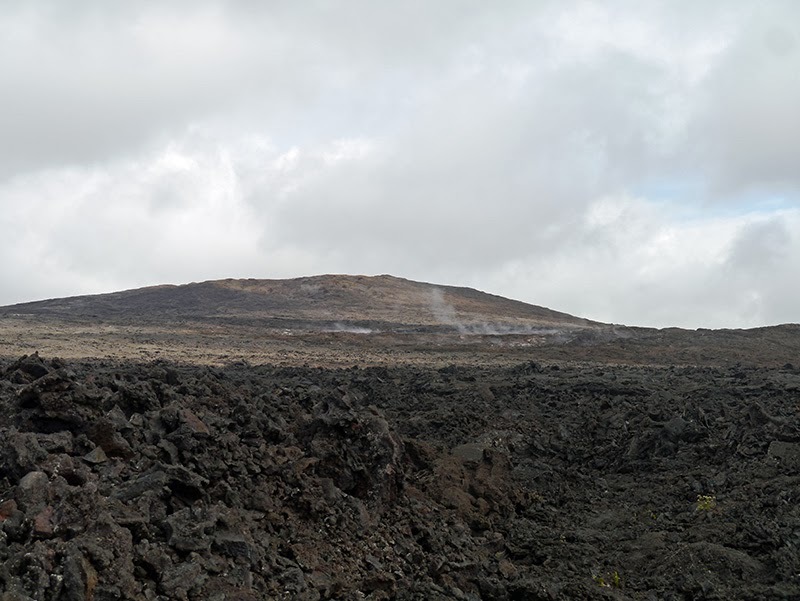 Unfortunately, we were unable to make it to Mauna Loa or Mauna Kea (which requires a 4-wheel drive vehicle to reach the summit), but all indications are that we would have enjoyed them equally well. 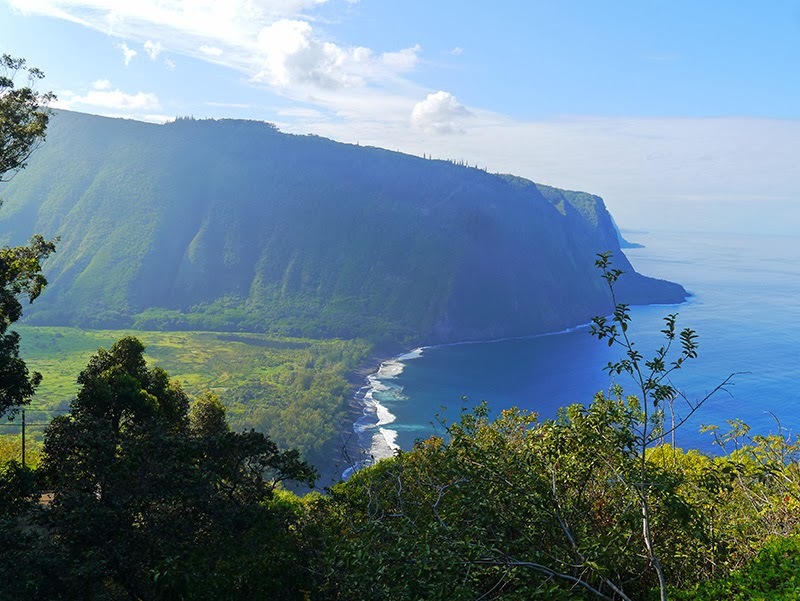 The National Park is one of the largest tracts of wilderness on the Big Island, if not the largest. 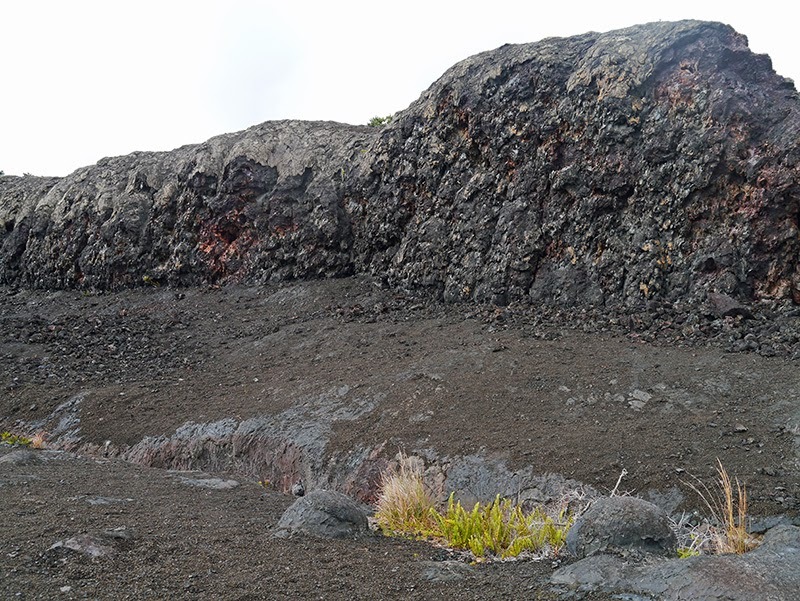 We made three trips to Kilauea. Our neighbors on sailing yacht Amandla invited us to go along with them on two excursions. 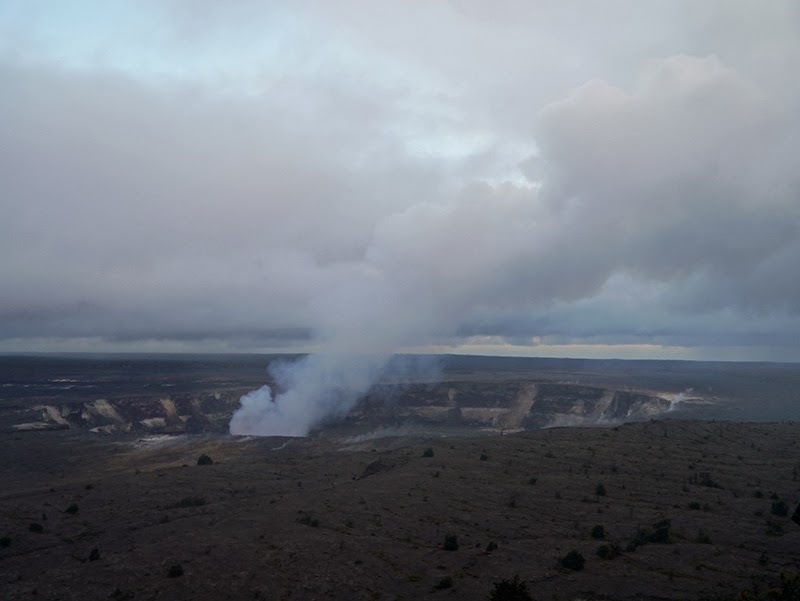 During the first, we took a naturalist-guided hike to Mauna Ulu, a summit on the eastern rift zone of Kilauea. 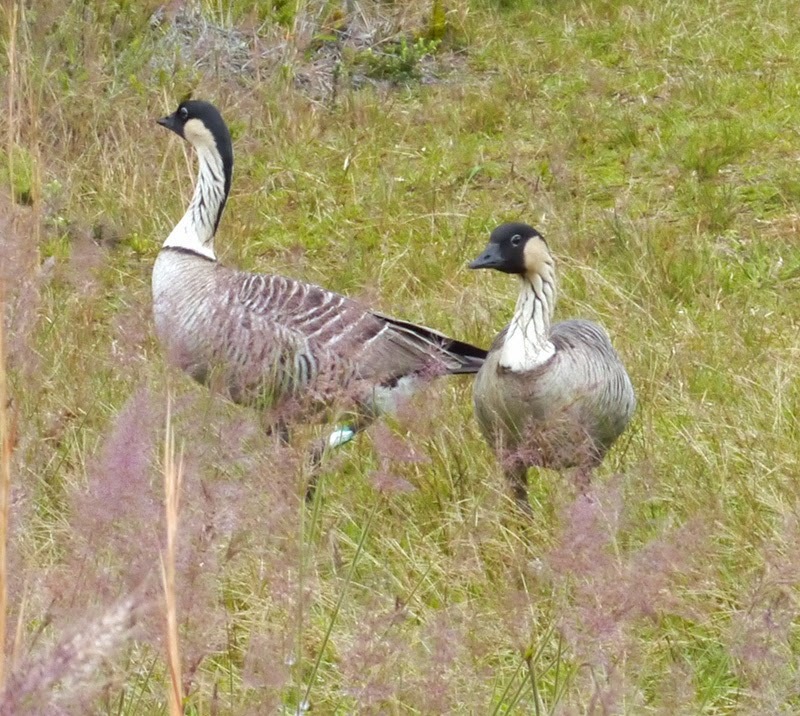 On this hike, we had our first encounter with nene, the Hawaiian native geese. 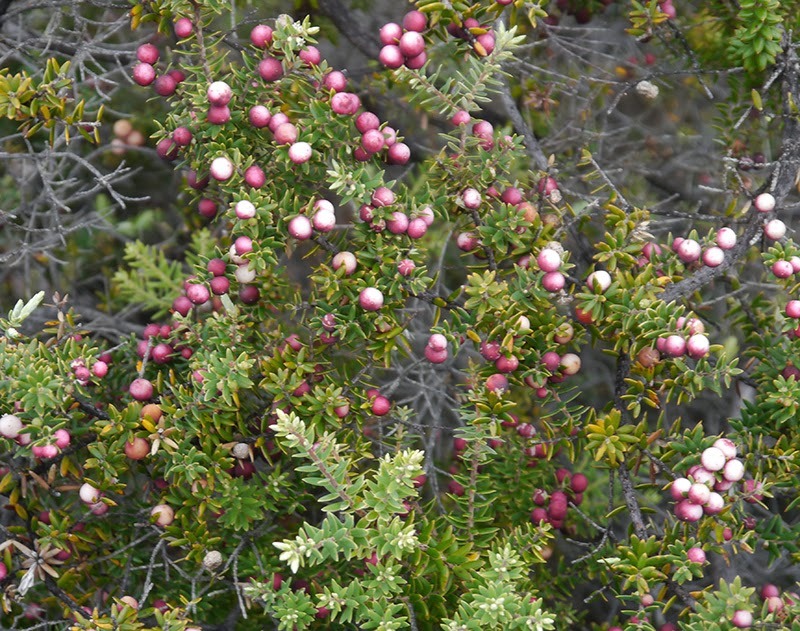 Our park naturalist guide, Adrian, also introduced us to a variety of the native plant species found in the park. Ohelo berries are a favorite food of nene: Edible for people too! 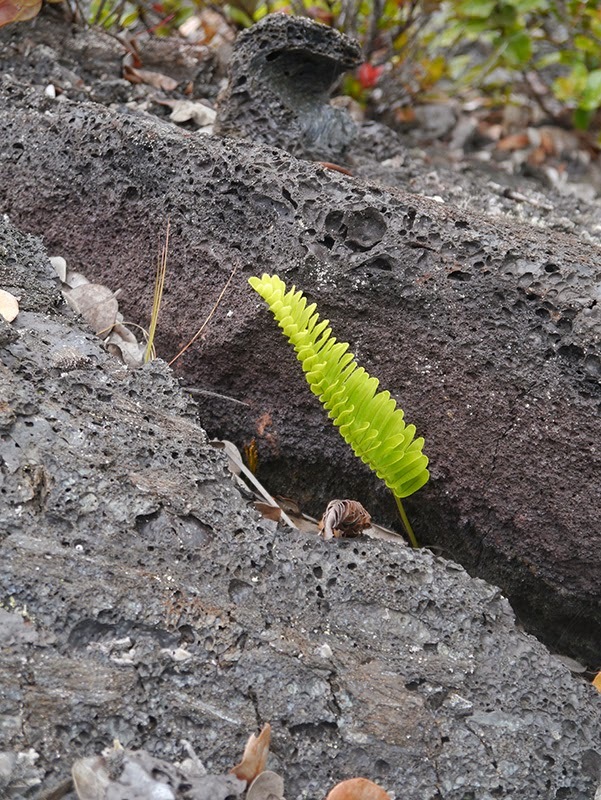 We learned that the first species to colonize bare lava are lichens and ferns. 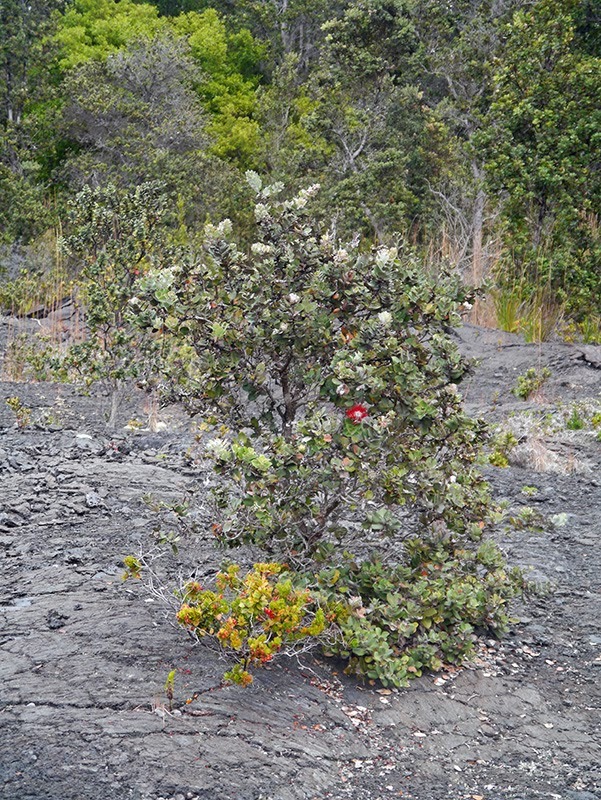 One of the most prolific native trees on the island of Hawai'i is the O'hia lehua tree. This tree looks exactly like the pohutukawa, or New Zealand Christmas tree. 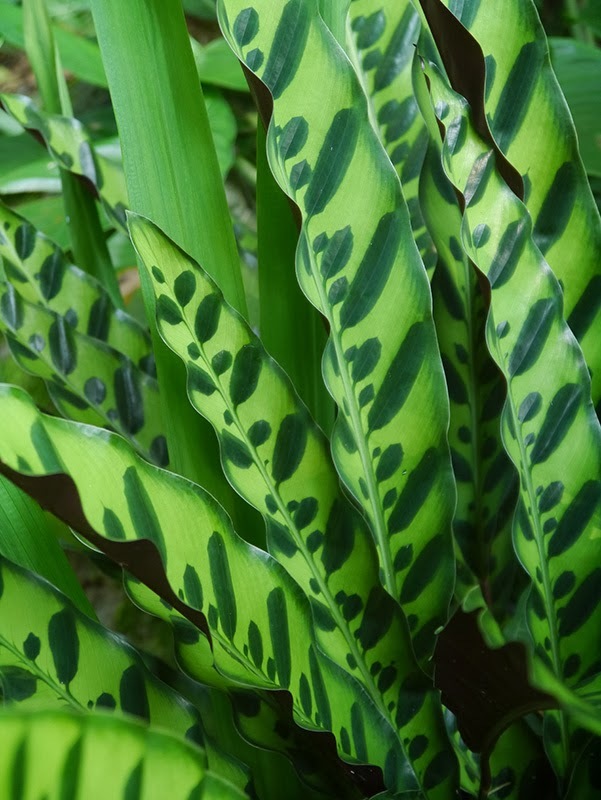 One very significant difference is that the stomata on the leaves of O'hia lehua trees close in response to sulfur dioxide gas; while the stomata on pohutukawa don't share this adaptation to a potentially toxic volcanic environment. How cool is that? 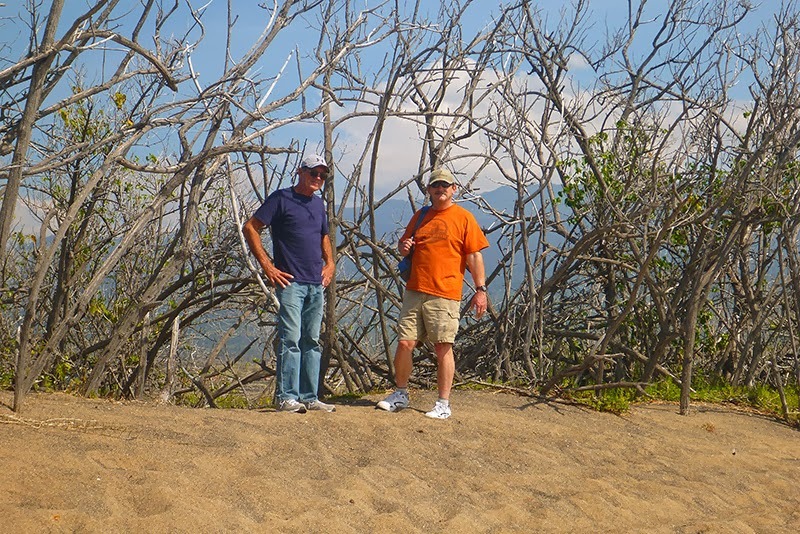 Adrian, our guide, was a wealth of knowledge about the native plants on the volcano. 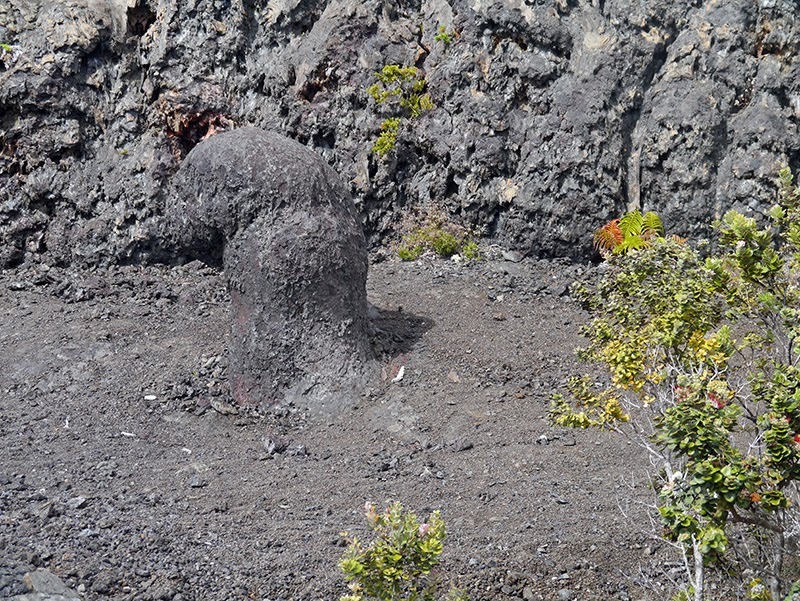 He also shared some cultural information with us, like this legend of the O'hia lehua tree: O'hia was a handsome young man, in love with the maiden Lehua. This young man caught the notice of the volcano goddess, Pele, and she presented herself to him. Pele wanted O'hia to be her husband. 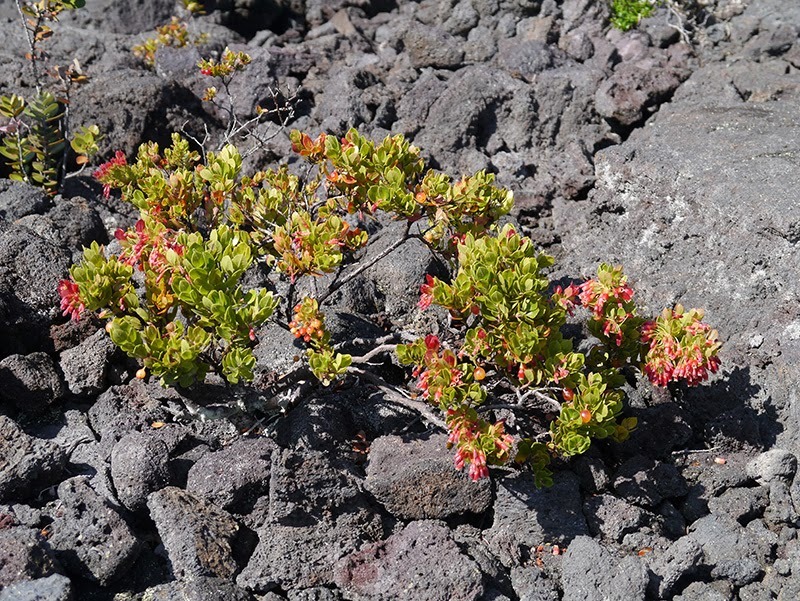 O'hia refused because he was deeply in love with Lehua. 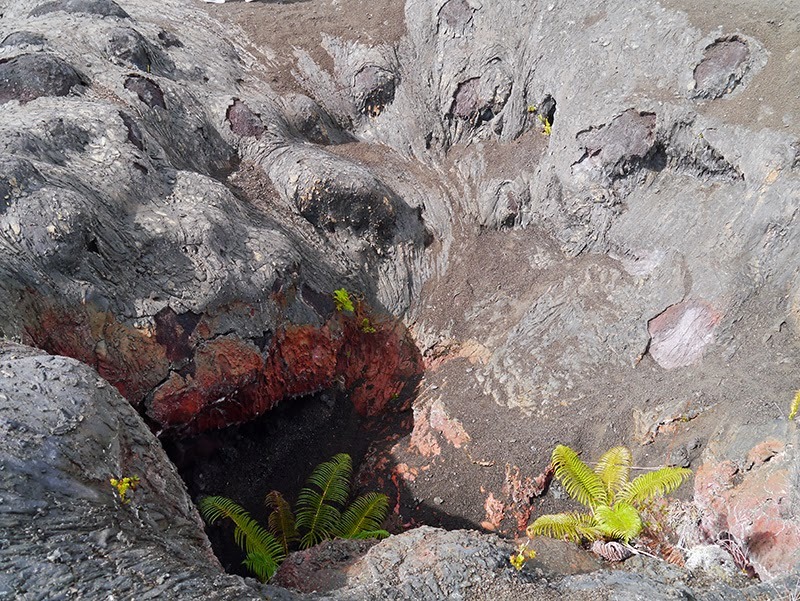 His refusal enraged the goddess Pele, so she turned O'hia into a tree. 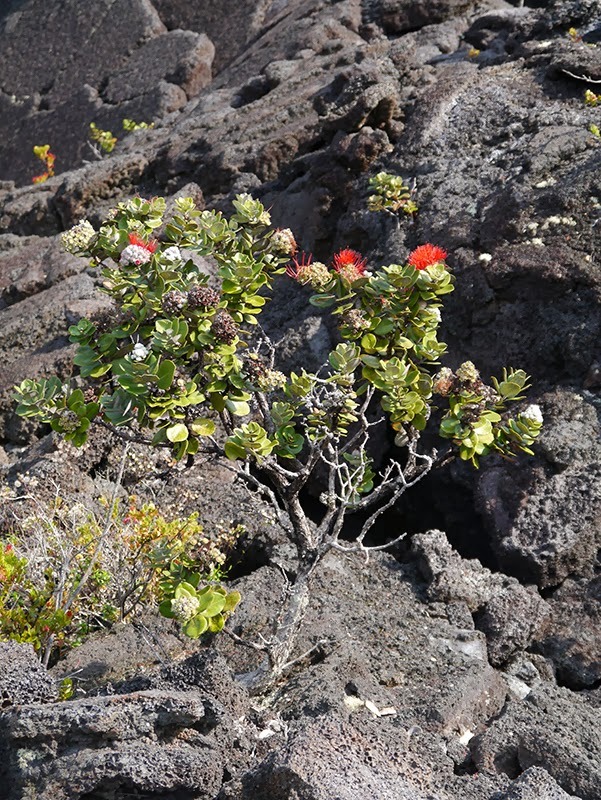 Some of the other gods, hearing of Pele's wrath, took pity on the star-crossed lovers, and turned Lehua into this red blossom, so that O'hia and Lehua could always be together. 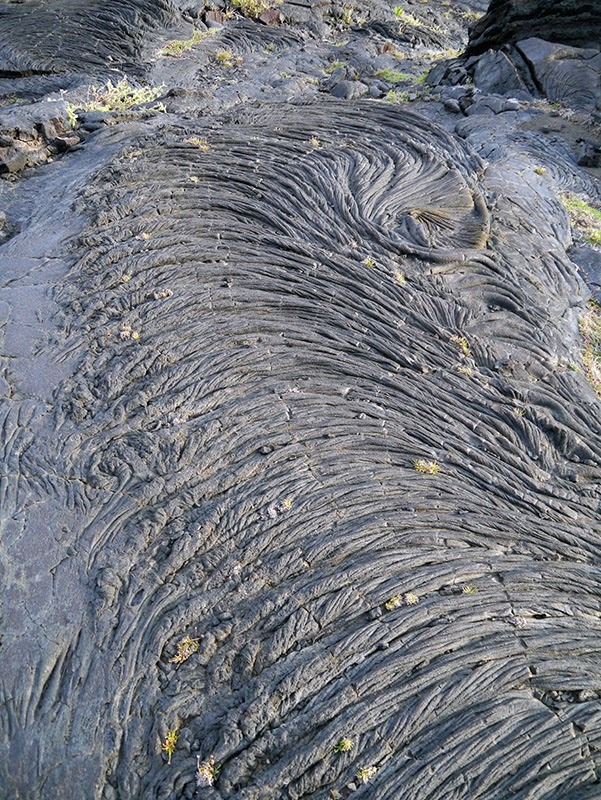 During the hike to Mauna Ulu, we also saw an interesting variety of lava formations. 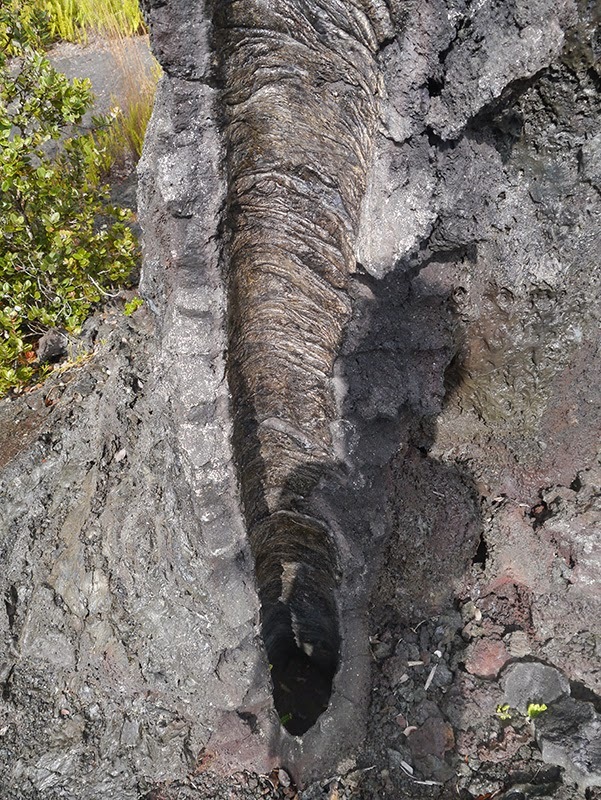 A lava tree and a tree mold: "Lava trees go up, tree molds go down." That's what he said. 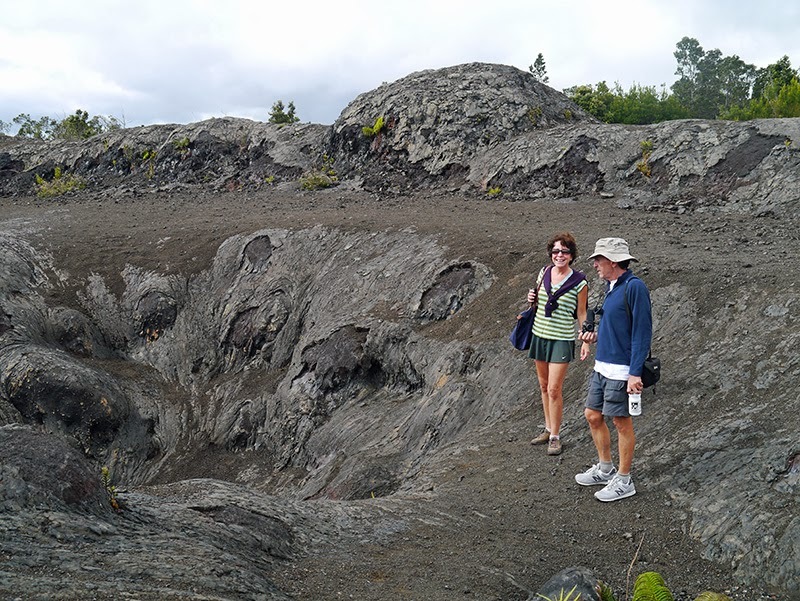 On the second trip, we drove down the Chain of Craters Road to the Holei sea arch, then visited the summit caldera of Kilauea. During our visit to the Big Island, we were disappointed to learn that the live lava from Kilauea is not currently flowing into the sea. We were hoping to both hike to the lava and see it entering the sea at night, as we sailed past the south end of the Big Island. 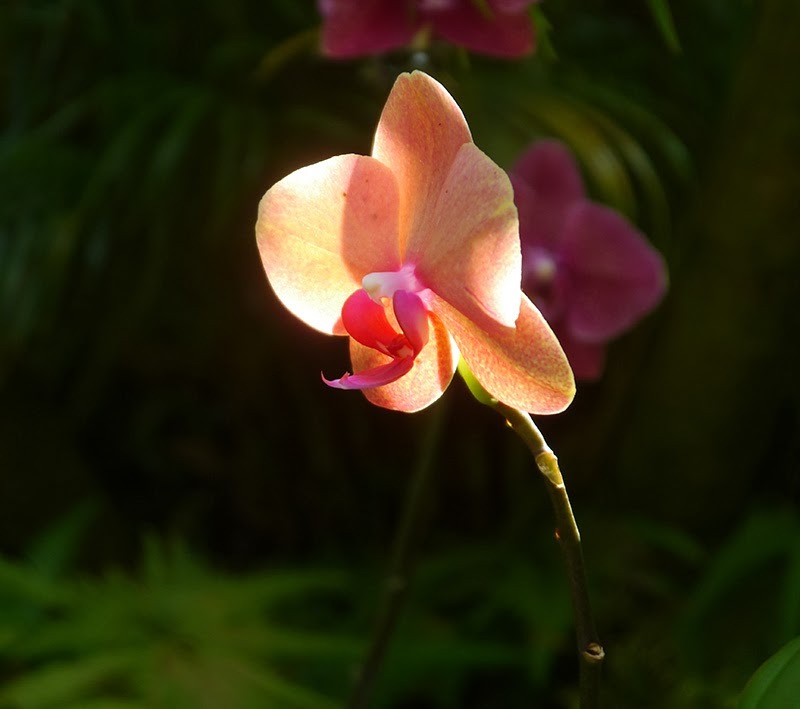 Instead, the live lava is now burning a path through virgin rainforest, and the only way to see it is by helicopter. 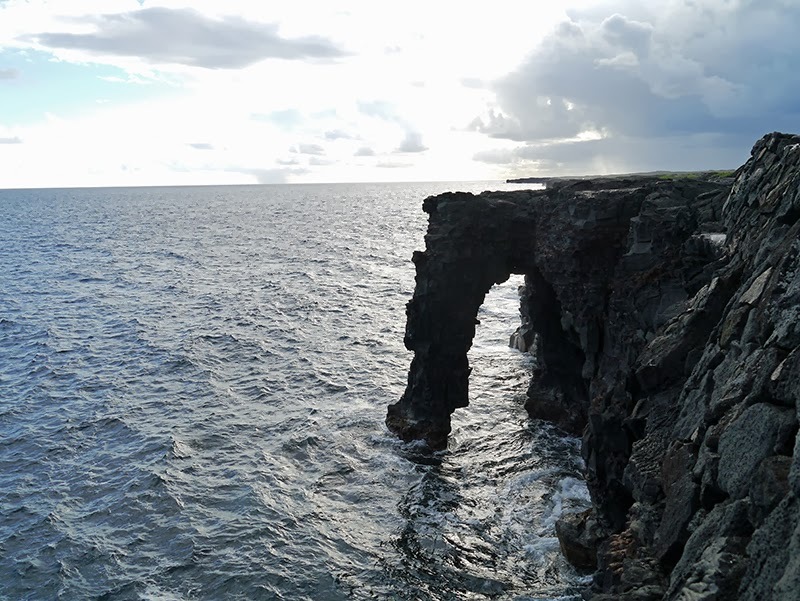 Nevertheless, we enjoyed the Chain of Craters Road and the area around the Holei sea arch, where lava has spilled from Kilauea's caldera in the past and made its way downhill to the sea. 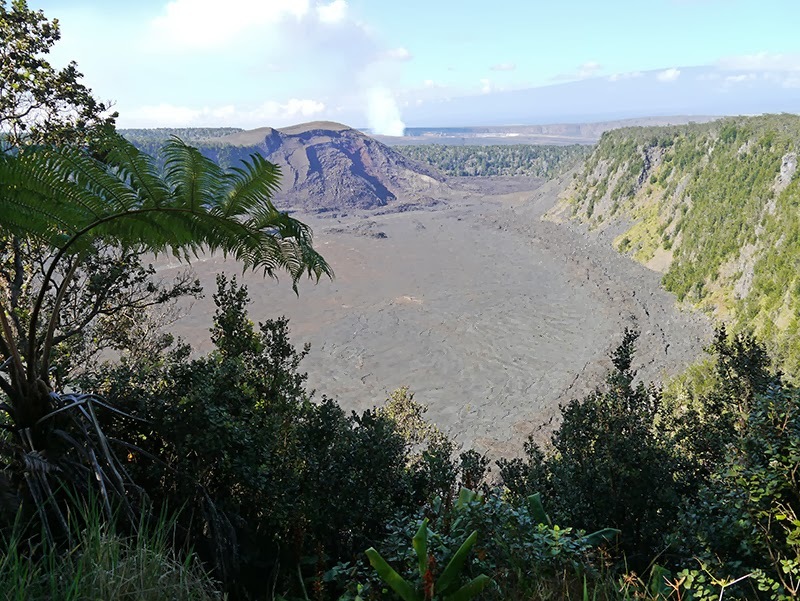 The highlight of our visit to the summit caldera was to see the smaller crater within the caldera, Halema'uma'u Crater. 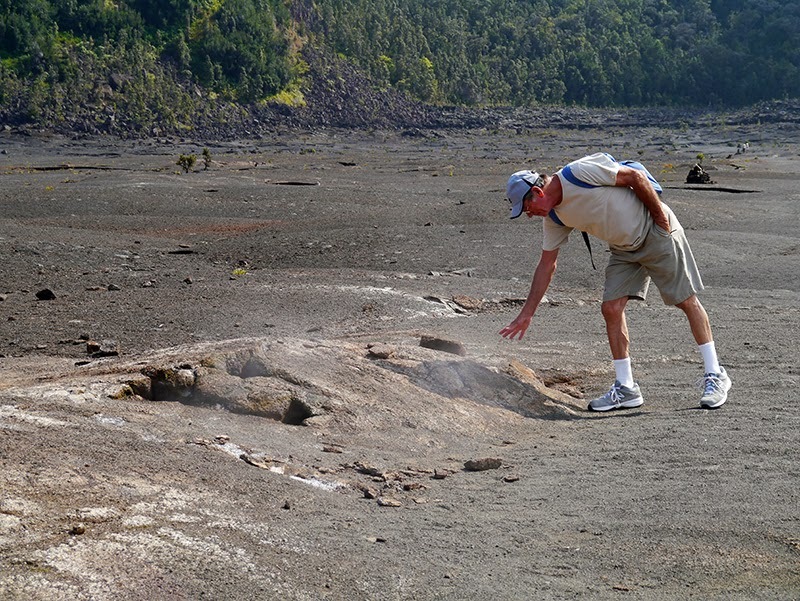 This crater currently has a live lava lake in the bottom of it; however, due to danger from sulfur dioxide fumes, visitors are not allowed close enough to see the lava. 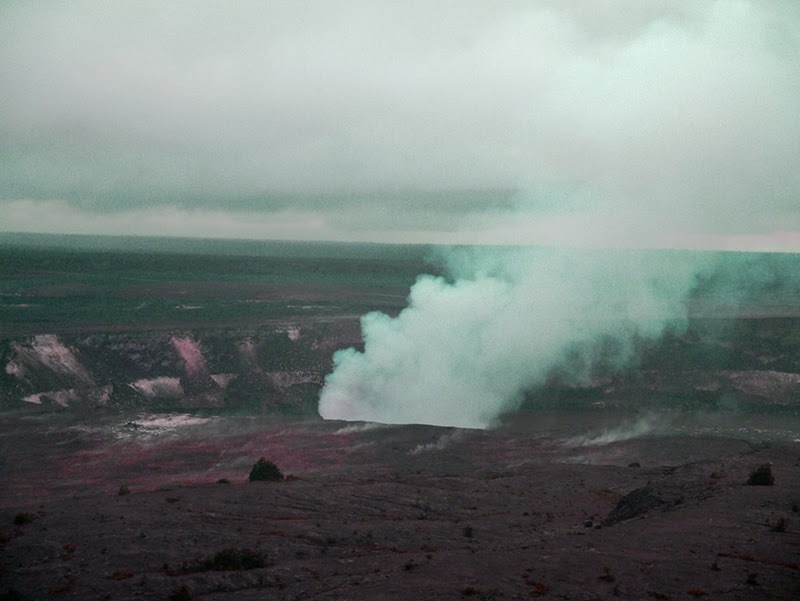 The best we could do was to observe the volcanic gases rising from the lava lake at the bottom of the crater. However, this spectacle is enough to give you the feeling that you are on an active volcano! 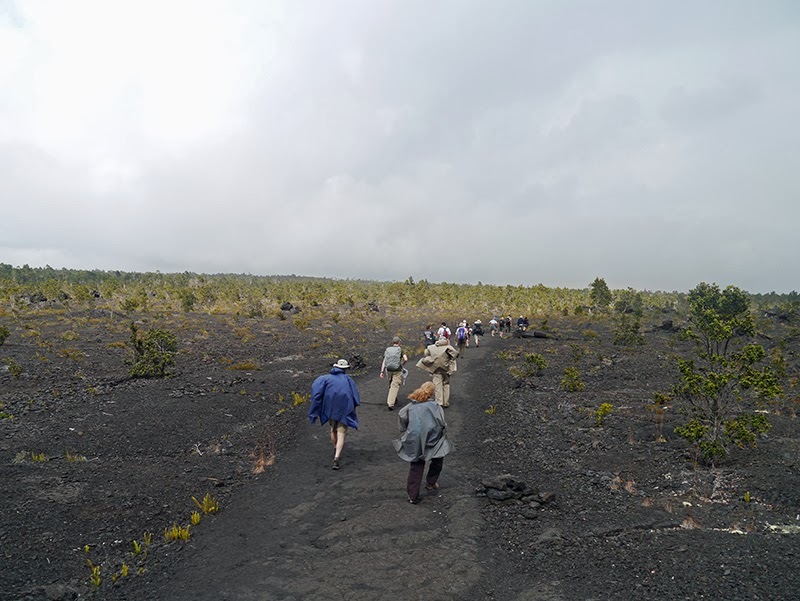 On our third and final trip to Kilauea, we hiked through rainforest and across a lava plain on the Kiluaea Iki trail. 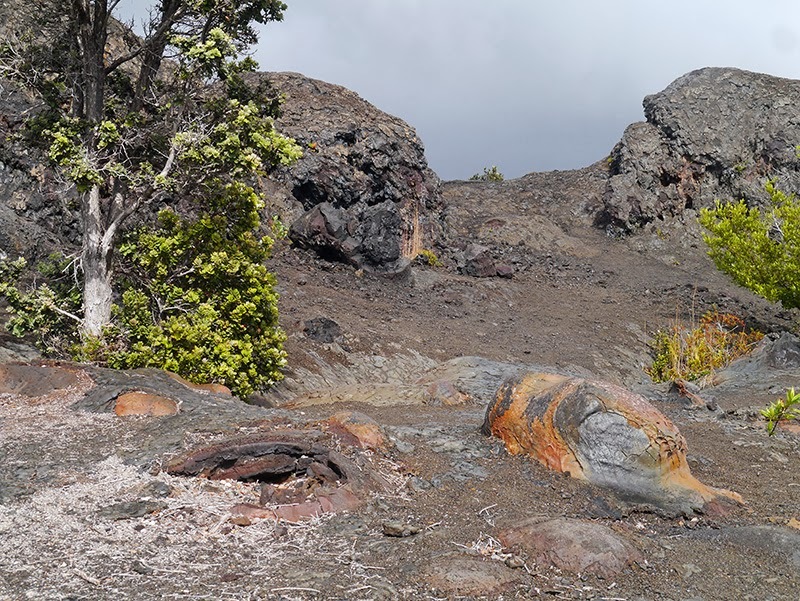 We also made a brief trip to the Puna district, where we visited Lava Tree State Park and I had a relaxing soak and swim in the Ahalanui Thermal Pool.This black lava pool contains a mixture of volcanically-heated fresh water and sea water. The sea water enters the pool through a cut in the sea wall at the far end; while the fresh water enters through vents along the sides of the pool. After seven weeks in Radio Bay, we both felt that it was time to move on. 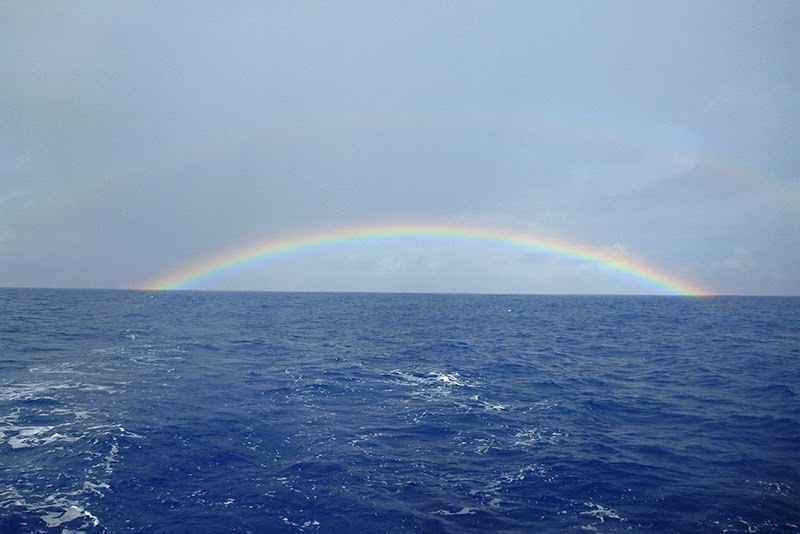 We had waited two additional weeks beyond when we were actually ready to leave in order to have a favorable weather window to explore a few anchorages on the Kona (leeward) side of the island. The title for this post really should have been In the Lee of the Big Island, but “cruising happens while you’re making other plans.” Shortly after we got underway from Radio Bay, we heard a revised forecast over the radio. Yet another high surf advisory was being given for Kona. In the meantime, we were making slow progress. We either had winds on the nose or no wind at all, and we were only making two or three knots whether sailing or motoring. It took us a day and a half (including two nights at sea) to reach our first proposed anchorage on the Kona Coast, Honamolino Bay. However, as forecast, the surf was high, and Patrick didn’t like the look of the anchorage; so we continued on. I was sorry to miss seeing Pu'uhonua o Honaunau, the historical park known as the Place of Refuge, which we had hoped to visit by dinghy from this anchorage. In Kaleakekua Bay, we again decided not to anchor overnight due to surf; but the cove near Cook’s Monument (where no anchoring is allowed due to the presence of coral) was calm enough for me to jump off the boat for a quick snorkel. With high surf on the Kona shore preventing us from anchoring, we decided to continue across the Alenuihaha Channel to Maui. We headed for the Alenuihaha Channel in ideal conditions, with fifteen knots of wind forecast from a favorable direction. That night was forecast as clear, while possible thunderstorms were predicted for the following night. Knowing we were going to be underway that night, we fell into our normal nap routine shortly after lunch. 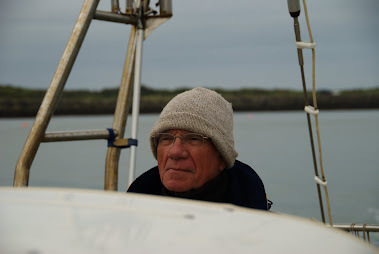 I relieved Patrick at the helm in the late afternoon after I had taken an hour and a half nap. In retrospect, as I pulled farther away from the Kona Coast while Patrick took his turn for a nap, there was an strange feeling to the afternoon. I was hand steering as the boat ghosted along at one to two knots in light airs. It was so quiet, I could hear the blows of humpback whales that were surfacing at some distance from the boat. One large bull was lolling at the surface, waving its flipper, occasionally rolling over, and bellowing. 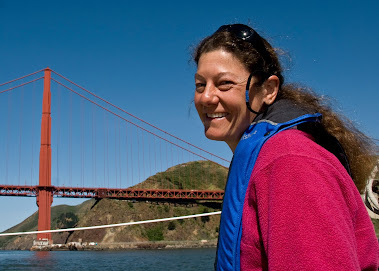 A school of dolphins came up to the boat, an unusual encounter in several respects: first, because we were going so slow, and dolphins usually eschew boats they can’t bow ride; and second, because the dolphins lifted their heads out of the water and made eye contact. It was so silent when the first dolphin approached, I could actually hear its squeal. It was a magical, mystical late afternoon---just me and the sails and the blows, bellows, and squeals of marine mammals---but in hindsight, it was eerie. After Patrick got up from his nap, we listened to the weather as we ate a quick dinner. Weather forecasts in Hawai’i change more often than people change their minds, so it shouldn’t have been a surprise that the forecast had changed again. A special marine advisory had popped up from the weather center at Honolulu. Radar had detected a line of electrical storms capable of producing water spouts, with attendant winds of 40 knots, headed in our direction. Mariners were advised to “take safe harbor immediately.” Oh, great. Patrick and I discussed it, but with the high surf advisory against the lee shore of Kona and no apparent “safe harbor” behind us, we decided to keep going. It was also unlikely, even if we did turn around at that point, that we would be able to outrun the squalls, which were traveling much faster than we were. I lay down for another nap with an uneasy feeling at 7 p.m. while Patrick took the first watch of the night. At 9 p.m., Patrick woke me with the call to get dressed and stand by. We were in the Alenuihaha Channel, and the first storm was over us. Patrick was already steering in 28-30 knot winds, pouring rain, and lightning. He had seen the storm coming on radar, so when I asked if he needed his rain gear or ski goggles, his reply was, “I already have them.” The boat was pointed all over the map---a good portion of time headed back towards the island of Hawai’i---as the wind rotated around it, and Patrick simply tried to hold the boat up into the wind. Luckily, none of the lightning ever hit close to us and we didn’t encounter any water spouts. The maximum gust was a little higher than forecast at 42 knots. A couple of hours later, after the large storm cells had passed and the winds were steadying up in the low to mid-twenties, we put up sail. Not long after that, we dropped the sail again and started the engine, as the wind had all but completely died again. At this point, we were both thoroughly frustrated because we had made so little progress all night. We were about a third of the way across the channel when Patrick woke me, and we were still a third of the way across the channel, four hours later. At 1:00 a.m., Patrick---who had already been up three hours past the end of his watch---took a turn in the pilot berth. I made myself a cup of coffee and settled in for a watch. Somewhere along the way, I had gotten my second wind. I felt wide awake and like I could go on forever. Suddenly, two pieces of good luck happened. First, the wind moved behind us for the first time on our supposed “downwind run” from the Big Island westward; and second, it increased in strength. I joyfully threw out the jib as we screamed across the Alenuihaha Channel on a broad reach. Patrick woke up briefly, and I told him to catch another hour of sleep. I engaged the wind vane, and the Monitor took over the steering. I held on and enjoyed the sleigh ride as once again, the effect of five knots of boat speed was positively dizzying after only traveling at one to three knots for the past two days! I kept thinking I should furl some sail. But then: a reality check: Our angle of heel was below 15 degrees, our boat speed was only five knots, and the wind speed was under 20 knots: We were fine! I sat back and enjoyed the speed as the distance between the boat and Maui diminished. After awhile, Silhouette started hitting over six knots consistently, as the wind slightly built. She started yawing a bit since we didn’t have the main up to balance the jib. And visions of the many humpback whales I had seen during daylight that afternoon started running through my mind. It was a miracle we hadn’t hit one in the dark! I partially furled the jib and slowed the boat down a knot. I woke Patrick to relieve me at 4:30 a.m. I went to bed after being up since 9:00 p.m. and most of the previous day and was up again at 7:30 a.m. The wind had lightened up and we were approaching the channel between Maui and Kaho'olawe island. Patrick caught a brief morning nap, but I had to disturb him when I feared that a tug and tow on our stern was going to try to squeeze between Silhouette and the island of Molokini (which was to starboard on the right side of the channel). After the name of the tug popped up on our Automatic Identification System (AIS) , Patrick gave them a call on the radio and together they decided that Silhouette would move to the Molokini side of the channel, as the tug was planning a turn to port after passing Kaho'olawe. We spent the rest of the day on a slow approach to Lahaina, sailing, motor-sailing, and finally motoring when the wind died completely. We were treated to a show from humpback whales along the way: whales breaching, slapping their tails, spouting, and waving their gargantuan flippers in a leviathan display of colossal proportions. We took a mooring in Lahaina around 3 p.m. that afternoon and couldn’t have been happier. What had started out as an overnight sail from Radio Bay had turned into three nights at sea.